Hello, everyone! I’ve been playing around with some new stitches from my crochet dictionary book, and one of the stitches I’ve been loving is the trinity stitch, so I thought I’d share it with you guys today. It’s a very simple stitch, but it adds a beautiful texture that really catches the light if you use a shiny yarn and it’s so quick to work up. I used it to make my Trinity Stitch Coin Purse and I’m so happy to finally have all that change at the bottom of my purse under control. 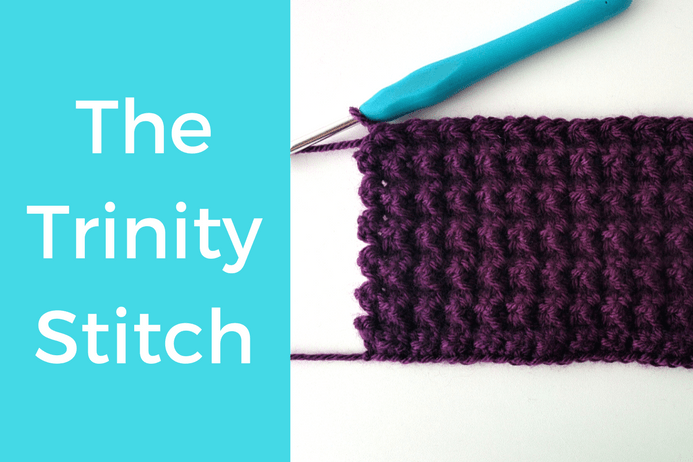 So, let’s learn how to work the trinity stitch! This is the first video tutorial that I’ve ever narrated, so I may sound a little nervous lol. I know that narrated videos are more helpful and easier to follow, so I’m trying not to be so camera shy! I hope you like it. And the written instructions are below too. This stitch uses a multiple of 2 +1, and an extra chain is added for the foundation. 1. Start with an even numbered chain. I began with a chain 12. 2. SC into the second chain from the hook. *Insert your hook into the same space as the stitch and pull up a loop, pull up a loop from each of the next two space as well. You should now have 4 loops on the hook. Yarn over, and pull through all 4 loops. This is a SC3tog. Chain 1 to close. * This is the first trinity stitch! Now, SC3tog along the row, always starting with the last space you already worked. At the end of the row, SC 1 into the last space. Repeat row 3 until your fabric is as long as you want it to be. And that’s it, now you’re an expert at the trinity stitch! I love how this stitch looks and especially how it feels. It’s a very simple stitch to try out if you want to add some texture to a piece and it doesn’t use as much yarn as a bobble stitch or a puff stitch. I hope you guys enjoyed this and are excited about learning new stitches. 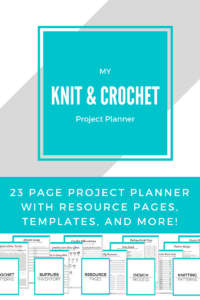 I’ll be posting more tutorials for different stitches soon, but in the meantime, check out that book I mentioned! 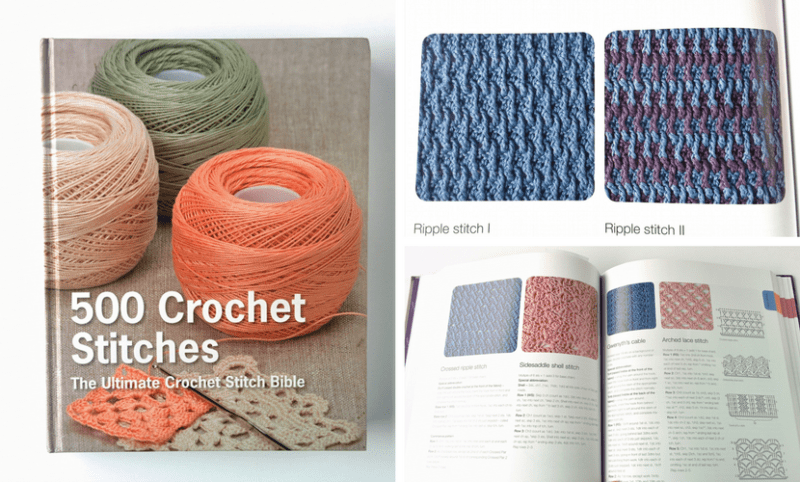 500 Crochet Stitches: The Ultimate Crochet Stitch Bible is so useful and I’ve been learning so much from it. Check out my full review of it here. That’s all for now! I’ll be back with another post really soon. 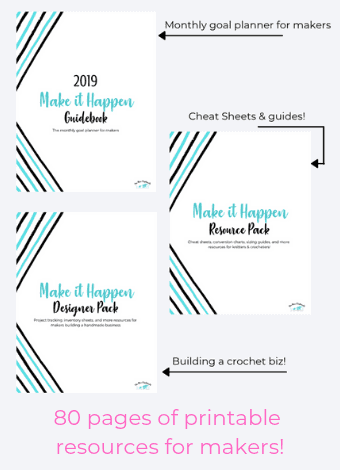 If you want to get email notifications for when I post (along with awesome freebies), fill out the box below to subscribe!